It was only a few issues back that the Scooby gang teamed up with a number of DC’s simian characters for all-out Battle of the Apes. However, absent from that episode was Hanna-Barbera’s own Magilla Gorilla. Either an oversight, or perhaps done with the intent of featuring him later. After an adventure amidst the swamp muck, the gang decides Scooby needs a bath. Fortunately, Peebles Pet Shop is handy. While there, Magilla is purchased by Doctor Hasenpfeffer, who takes Magilla to his spooky castle on the hill. Mystery Inc. has promised Ogee (Magilla’s child admirer) to check up on Magilla, and there’s no time like the present. But Doctor Hasenpfeffer is your typical mad scientist, and has ulterior motive for Magilla. It has perhaps become common for comic artists to maintain a library of poses and headshots of characters to be inserted, rather than redrawing the same image repeatedly. 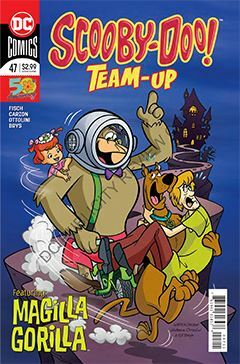 It’s especially obvious in some of the all-ages titles, but this issue of Scooby-Doo Team-Up, it’s less obvious than usual. It’s refreshing. There’s not much of a mystery to be solved here, but that’s okay. It’s a fun romp among the HB pantheon of characters, with the Scoobies to guide the reader. There’s even a sly reference to an obscure Looney Tunes character. I appreciate a break from the usual formula.